First Commercial Flammability Test Lab Launched in the Middle East. 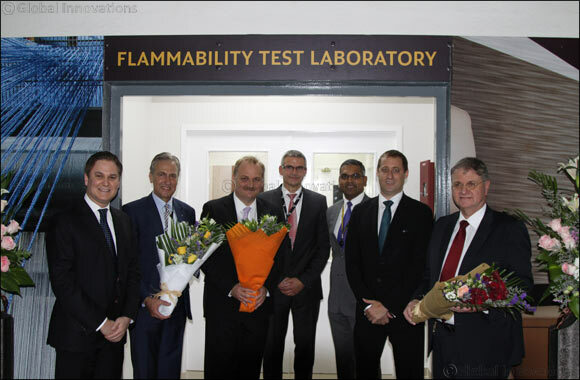 Dubai, UAE, December 28, 2016: Etihad Airways Engineering and Lantal Textiles AG have launched the first Flammability Test Laboratory in the Middle East, for regional customers within the aviation industry, including VIP operators, MRO organisations, design and production organisations as well as cabin interior suppliers. Located inside the Etihad Airways Engineering facility adjacent to Abu Dhabi International Airport, the new Lantal laboratory will provide test services that include flammability tests, seat cushion tests, heat release and smoke tests. The laboratory will conform to ISO 17025 quality management standards, and all testing will be conducted in accordance with the Airworthiness Regulations FAR / CS 25.853. Photo caption: At the launch of the Lantal Flammability Test Lab at Etihad Airways Engineering in Abu Dhabi, are: (left to right) Peter Baumgartner, Chief Executive Officer, Etihad Airways; Dr. Urs Rickenbacher, Chief Executive Officer, Lantal; Bernhard Randerath, Vice President, Design, Engineering and Innovation, Etihad Airways Engineering; Heiko N�ssel, Partner, Executive Vice President, Compliance and Certification, Lantal; Shevantha Weerasekera, Head of Engineering, Etihad Airways Engineering; Jeff Wilkinson, Chief Executive Officer, Etihad Airways Engineering; J�rg Metz, Swiss Consul.